We source our water from the Yellowknife River and put it through a 6 stage reverse osmosis filtering process. Next we use our bottle plant to clean and sanitize the bottles before they are filled and capped, the bottles are then quality checked and hand stacked on pallets. Bottling is a always two man operation. 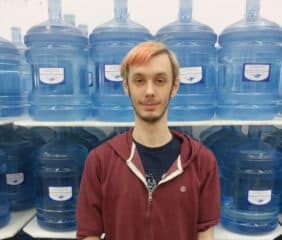 We also ship in 5 gallon bottles of spring water for our customers who prefer that taste. In the beginning, there was a garage. And in that garage were a few bottles of water and a couple dozen boxes of coffee trucked up to Yellowknife from a supplier in Edmonton. Having bought out the two previous partners, Peter and Annette were thirsty for some shekels. The Austins moved the contents of the garage into a bus depot and opened their doors to Greyhound freight. 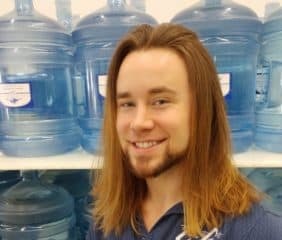 Customers coming in to collect their freight were introduced to the divine nectar in both the water cooler and the coffee machine and thus, Tundra Transfer was transformed from freight expediters to merchants of fine imported coffee and pure, clean water. The first customers, some 23 years ago, RTL Robinson and Air Tindi, remain loyal and steadfast customers. We salute them as well as the hundreds of other customers who have come to appreciate the great effort we put forth to meet your every need, your every expectation. Our staff of 13 are an eager and cheerful bunch and will (almost) always shed their worries in order to bring you, not only the absolute best in beverages, but also a heartfelt smile. Just look at Manvel and your day is already better. Need a mid-morning boost? Give us a ring and our Trusty Tim will deliver to your door. And out-of-towners, you too are on our radar. Call up Jeremy and he will eagerly expedite your orders. 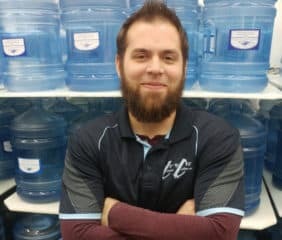 Nearly 2000 kilometres – that was the treacherous journey our Clear Arctic Springs’ water had to make from the treatment plant in Edmonton to Yellowknife some 23 years ago. The three partners would take their lunch hours to load 2 or 3 bottles of the precious cargo into their cars and deliver to a handful of loyal customers. Forty bottles was enough to supply the town for as much as six weeks. 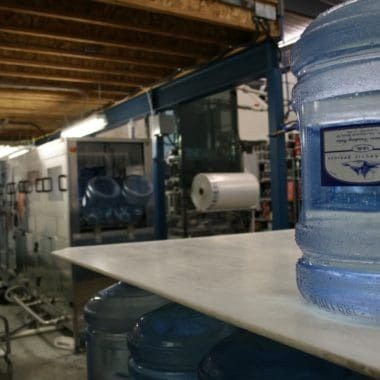 Today, with our efficient reverse-osmosis treatment system on site at 325 Old Airport Road, we manufacture 300 bottles each day to meet the needs of our customers. 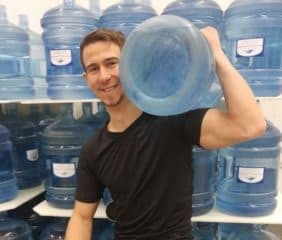 Step in and taste the difference pure water really makes or allow yourself the luxury of having our three oxen-strong men, Travis, Vincent and Garrett, bring the pristine water right to your doorstep. And they enjoy their labour (right, Travis?) as they have no need to work out in the gym after clambering in and out of the truck, ascending and descending countless stairs with 45 kilos of water in their fists. Going camping or boating? Our Diamond Ice is the perfect solution to keeping your beer cold. We make it from our reverse-osmosis water and therefore it is nearly indestructible. With no suspended solids for the heat to seek out, the ice stays solid 3 days longer than regular ice. And our unique bagged block ice, once it does melt, you can drink it! Tundra Coffee Co. offers you a myriad of coffees, hot chocolates, apple ciders, DaVinci syrups, biscotti and countless other goodies. Tempt yourself with our Highlander Grogg – coffee guaranteed to addict even the most stalwart of personalities. Our beans are so fresh they flirt with you. Allow yourself to get seduced. Or team up with one of our tea dames with handles like Sencha Kyotot Cherry Rose, Lady Hannah Fruit and Hojicha Green. We boast a large variety of coffee and tea equipment for home, office and retail use. We support that component of Tundra Coffee with a talented tech department. Goofy Gerard and Earnest Eric, our techs, are the rocket scientists of hot and cold beverage equipment. But we count on them for so much beyond the myriad of brewers, slush machines and coolers we supply, but also to manage and maintain our reverse-osmosis water plant. Don’t forget to keep us pinned to your calendar for any special occasion. Our gift baskets are unique and each one is lovingly hand-crafted. Tundra Transfer continues to evolve and most recently we have added a scheduled cargo service between Yellowknife and Hay River and all points in between. This rounds off nicely with the cargo service we have managed for years as agents for Northwestern Air Lease in Ft. Smith. Our bottled water service is reliable. 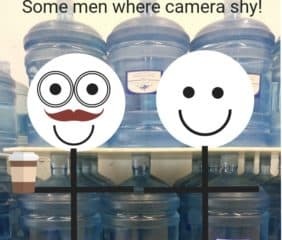 We will visit your water cooler on a regular schedule either weekly, biweekly or monthly and bring you the elixir of reverse osmosis water sourced from the Yellowknife River. One sip of our Clear Arctic Springs' water and your resolution to drink yourself to health, better circulation, weight loss will be satiated. We deliver to businesses Monday - Friday, residential addresses on Saturday and Behchoko (Rae Edzo) every Wednesday. 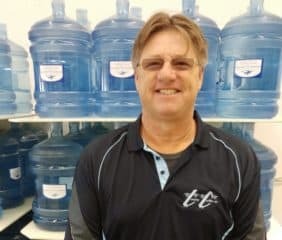 Contact us if you'd like water delivered right to your door or cooler! 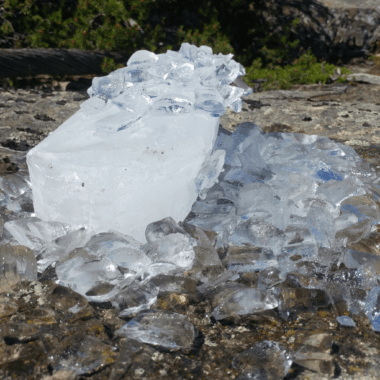 Our Diamond ice cubes and blocks are made with reverse osmosis water, because we remove all minerals from our water in processing our ice stays frozen much longer than regular ice- the blocks can stay frozen in a cooler for up to 2 weeks; making them an ideal cooler staple for boating or camping trips. The blocks come in bags that are sealed, so they can be opened and drank or refrozen when they thaw. Our Diamond ice cubes don't ruin the flavor of your drink when they melt because they are made with our signature great tasting water! Our friendly and personable staff will come to your house or business and clean your water tank (or tanks.) Standard tanks are $350.00 per tank. We do water tanks on the Ingraham trail, we charge an extra $50.00 to cover our gas and time to get out there. Our water tank cleaning will completely disinfect your tank, we first empty your tank then use a combination of a pressure washer and vacuum to remove all debris. The only chemical we use is household bleach to disinfect as we clean. Your tank is thoroughly rinsed to remove all traces of bleach. Meet our talented team of specialists! 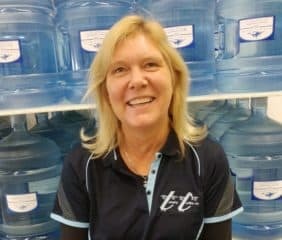 Annette is the heart and soul of this operation, one of the founding partners she has been in this business since 1996. Dennis is Tundra Transfer’s Mr. Bean: triumphant in innovation, unique in his problem-solving abilities, affable and vivacious. He is, in equal measure, as nonsensical in fun as sensible in business. We had to simplify Jeremy’s title to Warehouse Manager because adding Happiness Personnel, Class Clown, Nutrition Resource Manager, Staff Psychologist, Special Events Co-ordinator and All-Round Good Bloke did not fit on his business card. Gerard and Eric make a fantastic team, together with a smile they keep all the equipment we rent out in top shape AND take on repairs of other various equipment. 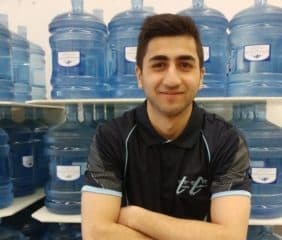 Arman is the son of Tundra Coffee's service specialist; Manvel, he has been around our business since he was a kid and is now pursuing a career in accounting; where better to get some on the job experience while doing courses than here?! 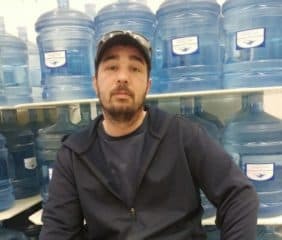 Travis is our veteran reliable water delivery driver, he knows all our customers and where to find them and will get you your water fast! Vincent has fit in perfectly with our team, when we need an extra hand Vince is always there to help. He's great with other staff and customers alike- a great addition to our company. Garrett has been coming and going for over 7 years now, there isn't a job at any of the three divisions of Tundra Transfer that Garrett hasn't tried; Garrett does it all! Meet Keanan, our custodian who is as gentle in nature as he is tough on dirt. Don’t let his whimsical nature fool you. A self-confessed sweet tooth, he will nonetheless take a bite out of any political conversation.